In his piercing introduction to An Economic Interpretation the author wrote that 'whoever leaves economic pressures out of history or out of discussion of public questions is in mortal peril of substituting mythology for reality.' It was Beard's view that the founding fathers, especially Madison, Jay, and Hamilton, never made such a miscalculation. Indeed, these statesmen placed themselves among the great practitioners of all ages and gave instructions to succeeding generations in the art of government by their vigorous deployment of classical political economy.In this new printing of a major classic in American historiography, Louis Filler provides a sense of the person behind the book, the background that enabled Beard to move well beyond the shibboleths of the second decade of the twentieth century. While the controversies over Beard's book have quieted, the issues which it raised have hardly abated. Indeed, one can say that just about every major work in the politics and economics of the American nation must contend with Beard's classic work. 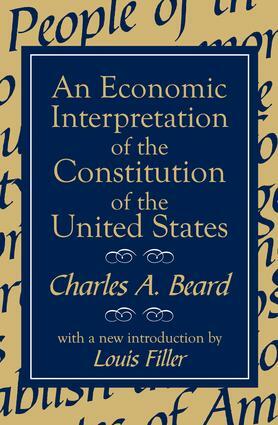 Beard's work rests on an examination of primary documents: land and slave owners, geographic distribution of money, ownership of public securities, the specific condition of those who were disenfranchised as well as those who were in charge of the nascent American economy.The great merit of Beard's work is that despite its incendiary potential, he himself viewed An Economic Interpretation in coldly analytical terms, seeing such a position as giving comfort to neither revolutionaries nor reactionaries. Attacked by Marxists for being too mechanical, and by conservatives as being blind to the moral purposes of the framers of the constitution, the work continues to exercise a tremendous influence on all concerned. The fact that Beard wrote with a scalpel-like precision that gripped the attention of those in power no less than the common man is, it should be added, no small element in the enduring forces of this work.